If you wear coloured contact lenses frequently, you may prefer to use contact lens tweezers to handle your lenses. 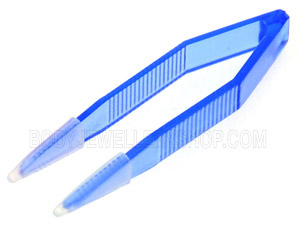 Contact lens tweezers are soft-tipped tweezers that you can use to pick up your lenses. They make it easy to handle your lenses and prevent accidental damage. Some contact lenses can be very delicate and it is easy to scratch or rip a lens. This is especially true if you have long nails – you should never use your nails to pick up a contact lens. Soft-tipped contact lens tweezers are very gentle on the lens and ensure that your lens is not damaged in any way. No matter what type of coloured contact lenses you wear, you will need a contact lens case to store them in. Most colour contact lenses are sold in packaging that cannot be resealed, so if you want to wear the lenses again, you’ll need to buy a storage case. There are a few different types of contact lens cases available, but you can see the two most popular types below. Regardless of which contact lens case you choose, the most important thing is to make sure that both the case and your lenses are kept clean and in good condition. I recommend using a new contact lens case for each pair of lenses. You should never share a contact lens case with other people or use a case that is damaged. When you buy a new case, rinse it out with contact lens solution. Some cases can be boiled or sterilised, but some can not, so check the label before doing so. 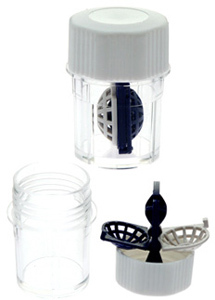 A screw top contact lens case has separate compartments for the lenses and each compartment has its own screw-on lid. These lens cases are very easy to use and clean. They keep the lenses separate, which makes them easy to handle and pick up. The flat shape is easy to store and great for travel. Screw top coloured contact lens cases are widely available and very cheap, so they don’t add to much to the cost of wearing coloured lenses. This type of contact lens case is more associated with prescription contact lenses but is just as good for storing coloured contact lenses. Barrel lens cases have two flip-down sections in which the lenses are stored. The barrel is filled with contact lens solution, so the lenses are kept submerged in solution at all times. This type of contact lens case is a little more fiddly to use but allows the lenses to be surrounded by solution on all sides. They can be more fragile and therefore not as good for travel, but are still a great option for storing any contact lens.